The Robber Barons Gave Most of Their Fortunes to Charity - Fact or Myth? Many Robber Barons gave away much of their money to charity. Did the Robber Barons Give Away Their Fortunes to Charity? Andrew Carnegie, John D. Rockefeller, and other Barons of Industry freely gave away most of their fortunes to charitable and philanthropic causes. These men, who amassed fortunes taking America from post-Civil War to world super power, are often looked back on as corrupt and at the core of worker exploitation, but their story is much more complex than that. FACT: Although he hardly speaks for everyone, Andrew Carnegie’s 1889 essay the Gospel of Wealth describes the mindset of the Great Philanthropists of the Gilded Age. Before we move on, we have to differentiate between philanthropy and charity. Although we can use the words interchangeably in common language, with “charity” being a placeholder for both, there is a definite distinction when it comes to philanthropy the super-rich. Philanthropy is when someone uses their money for the good of others, which is an individualist type of giving. Charity is when money is given to an organization that uses it for the good of others, which is a collectivist type of giving. So when we say they “gave away” their money “to charity,” we mean they directed their money through philanthropy for what they thought was the public good. Both philanthropic and charitable causes are types of “charity,” and the Barons did both, but the Baron’s primary Gospel of Wealth was specifically one of self-directed philanthropy, and not charity, especially not charity directed by the state. The Barons aren’t at the heart of the socialism vs. capitalism debate regarding their for-profit companies. They are at the center of the debate in terms of their non-profit companies and how social welfare should be handled. Marx would say 100% state directed; Carnegie will say 100% directed by individuals. History strongly hints that neither absolutist stance is fully effective and that both theories deserve examination of their merits and pitfalls, but that point is an aside to the charitable and philanthropic actions of men like Carnegie and Rockefeller. See the videos below for a mix of viewpoints and more insight into the Baron’s Gospel. Carnegie and the Gospel of Wealth. Carnegie wasn’t the only captain of industry turned philanthropist to introduce America to the pros and cons of the free-market, but it is his story that is at the heart of the “Robber Baron” discussion. Carnegie “wrote the book” on philanthropy in America, that book is an influential 1889 article called The Gospel of Wealth. TIP: Many captains of industry gave away their fortunes. Cornelius Vanderbilt, whose great-great-grandfather came to America as an indentured servant in 1650, was a philanthropist. Others were Jay Gould, the infamously ruthless (so the stories say) Baron, Leland Stanford, whose name should be familiar if you go to Stanford University, Henry Ford, and Thomas Edison. Today great philanthropists include figures like Bill Gates. TIP: This article from philanthropyroundtable.org offers a valuable perspective on philanthropy and the super-rich. Philanthropy is the free-market alternative to the state-forced distribution of means ( Socialism), so its merits are worth consideration in a capitalist society. Seven Myths about the Great Philanthropists. How Rockefeller Became the Richest American Ever. The ends of pure industrial “robber baron style” capitalism may be said to be “mixed” (for lack of a better overarching term), but the ends of their philanthropy was much more toward what any rational person would consider moral. What is the Origin of the Term Robber Baron? The term robber baron derives from the Raubritter or robber knights. These medieval German lords charged nominally illegal tolls unauthorized by the Holy Roman Emperor on the primitive roads crossing their lands or larger tolls along the Rhine river. They lined their pockets at the cost of the common good without adding anything of value. The idea of land ownership and rent seeking are at the heart of the argument of capitalism v. socialism and ironically or not, the game Monopoly). Despite its roots in the 1850s, it was not until the Great Depression that the term “robber barons” took hold and flourished. In 1934, Matthew Josephson published The Robber Barons, a scathing indictment of business in the Gilded Age. The Robber Barons and the Progressive Era | Tom Woods. This video and the one below makes a case that not only the charity of the industrialists but their actual business practices were good for the country. In fact, this libertarian Mises Institute video proposes that the Baron’s “monopolistic” business practices were good for America and that it was their philanthropy, Carnegie’s “give it away” philosophy, and especially the cronyism in rampant competition with the free-market Barons that is the root of the world’s ills. A Radical view, but one worth consideration. Milton Friedman – The Robber Baron Myth. I don’t always agree with Libertarians, but when I do it’s over this one issue and classical liberalism. Friedman is a famous free-market economist of the Reagan era. On our site, we strongly feel that Libertarians, Conservatives, and Modern Social Liberals all have merit and that correctness is found in the balance of these views. See our breakdown of the basic political parties for that viewpoint. Andrew Carnegie was a paradoxical figure. He was an immigrant to America from Scotland who came to America from a meager background in 1835. He moved forward, fast becoming (for a time) one of richest and most powerful men in America with a lot of elbow grease and luck. He supported workers’ rights but destroyed unions. He amassed capital beyond what a figure like Bill Gates has today but did this on the backs of workers. He tried to give his entire fortune away and literally(-ish) wrote the book on philanthropy. In fact, it was an article, see below. Human behavior is driven by self interest, but self-interest is often oddly charitable (just ask Adam Smith). The Business of Benevolence: Andrew Carnegie’s Legacy of Strategic Giving. TIP: You know how you go to Carnegie Hall? Or how the PBS show was presented by the Rockefeller Foundation? This is because the Barons of industry gave away their fortunes to American charities. 100 years later we still feel their impact. Other impacts included anti-trust laws and worker unions that arose in a response to their less charitable work. ANDREW CARNEGIE AND NAPOLEON HILL DOCUMENTARY. 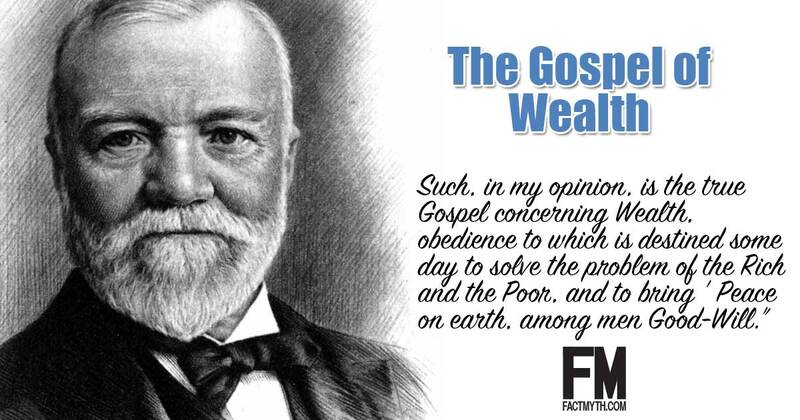 In June of 1889 Carnegie wrote an very influential article called The Gospel of Wealth. In Wealth, Carnegie describes the responsibility of philanthropy by the new upper class of self-made rich. Carnegie proposed that the best way of dealing with the new phenomenon of wealth inequality was for the wealthy to redistribute their surplus means in a responsible and thoughtful manner. This approach was contrasted with traditional bequest (patrimony), where wealth is handed down to heirs, and other forms of bequest e.g. where wealth is willed to the state for public purposes. TIP: Carnegie believed in a 100% estate tax that forced the rich to direct their money, less it be directed by the state as charity. He believed in a version of philanthropy that was entirely driven by the free-market. In accordance with the tenets of the gospel of wealth, many of the “barons” gave away sums (so to speak) by directing most of their fortunes to philanthropic causes. The amounts they directed this way aren’t comparable to anything we can find today. They funded everything from churches to art museums to public swimming pools. Carnegie–who liked to call himself a “distributor of wealth”–by some calculations donated over 90 percent of his vast fortune to projects like the 2,811 libraries he founded in towns across the United States and all over the world. John D. Rockefeller gave lavishly to religious mission work, hospitals, schools, and countless other philanthropic organizations. Many of the industrialists endowed scholarship funds and universities, although ironically most of them did not have university degrees. The Industrialists, many of them who had made their way from nothing to titans of America and the world, followed Carnegie’s lead and moved from competing over a bottom line to competing over who could give the most away. Adam Smith would argue that there is little to no difference between the two forms of competition, each scratching the same god given itch. TIP: See Captains of Industry by biography.com for more reading. Today we might think of the Robber Baron’s celebrating the free-market, exploiting workers, and crying “greed is good”… but this is a misreading. By the 1890’s many of these captains of industry had turned to philanthropy, using their fortunes to support the next era of America to follow the Gilded Age, the Progressive Era. “A Romance of the New Era”. Harper’s New Monthly Magazine. LXXXIX (DXXXIV). November 1894. Retrieved 2009-07-10.